What a special night! Thanks all who came and celebrated, participated, and supported the first Portland Dance Film Fest! Watch the film that you participated in below and download here. Then share! #PDFF2017 This film was shot, live edited, and screened in 5 hours! Read about the amazing artists who made this happen below! An evening of celebration and insights as we kick off the First Annual Portland Dance Film Fest! 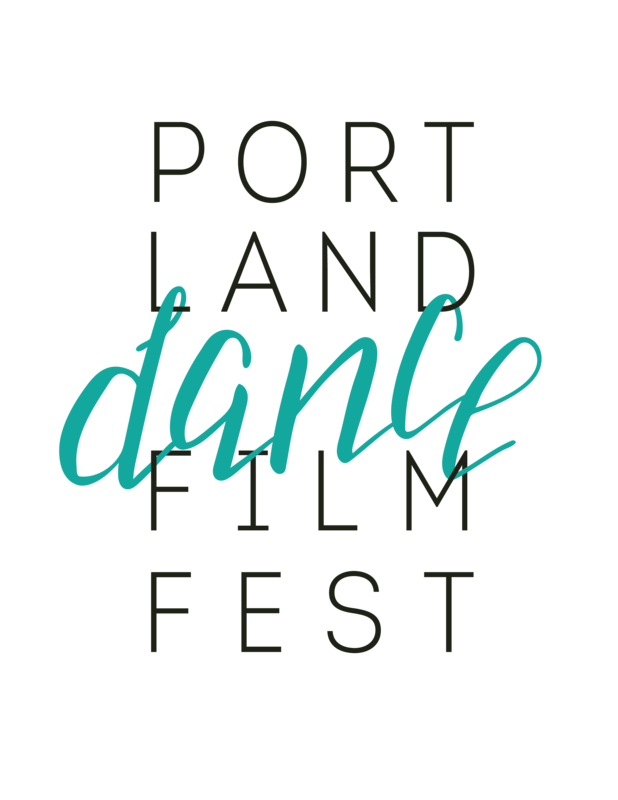 Join us at Bad Habit Room in North Portland for a taste of PDFF with the first dance for film screenings of the festival, an interactive dance for film creation with director and filmmaker Tomas Valladares, choreographer and dancer Katie Scherman, and live editing by Tiki! Stay to the end and you might see yourself in the final product! Also – drinks, food, merch, and dance-able jams. You never know what magic can happen when the libations are fresh off the bar, the atmosphere is sparkling, and the people are ready for the delight of dance! Tomás Alfredo Valladares is a creative producer, director and filmmaker. He has over 12 years experience creating documentaries, commercial video projects, music videos, and visual art projects. Originally from South Florida he is now the founding co-director of the Portland Street Art Alliance. Katie Scherman is an artist, choreographer, teacher, and movement researcher based in Portland, OR. Originally from California, Scherman has performed with Houston Ballet, Alonzo King’s LINES Ballet, Washington Ballet, Hubbard Street 2, Zhukov Dance Theatre, Terpsicorps Dance Theatre, Bodyvox, and in numerous festivals and galas around the world. In 2009, she was honored with a Princess Grace Award in Dance. Scherman holds a BFA in Dance from LINES Ballet/Dominican University and an MFA in Dance from the University of Oregon. She was awarded a graduate teaching fellowship at the University of Oregon from 2012-2015 and is the 2015 recipient of the UO Graduate Student Emerging Artist Award. Her research is deeply rooted in the creative process, vulnerability, and collaboration. Scherman was awarded a 2016 Alembic Artist Residency at Performance Works NW where she premiered her first evening length work, “Complicated Women” in which she directed, choreographed, and performed in. Scherman has held guest residencies at Pacific University, University of Utah, LINES Ballet/Dominican University BFA program, and the Bodyvox Junior Artist Generator program. Her choreography and teaching have been presented throughout the US. Most recently, Scherman held a Visiting Assistant Professor position in the School of Dance at the University of Utah where she taught, choreographed, and mentored students. She was also a 2017 Guest Artist for Salt Dance Fest. For the 2017-2018 season, Scherman will create a new work for Salt II Contemporary Dance Company and the JUNTOS collective, as well as restaging works on the LINES Ballet BFA program and the JAG Bodyvox program. Scherman‘s project company “Katie Scherman + Artists” will premiere a new work in Spring 2018 as part of BodyVox’s 20th anniversary season. Willamette Week Interview with Director Kailee McMurran! White Flag is an experimental short dance film inspired by aesthetics from the Greek Classical period. The purpose of the film is to elevate dance as a visual form, and to create a more intimate presentation of performance art, devoid of a traditional stage-like setting. Being a highly stylized and visual piece, the focus is placed on utilizing improvisational movement to interact with the environment and surroundings. Myth-inspired choreography brings dancers together in kaleidoscopic movement. In the fringe where you dance with your shadow, where being naked flows seamlessly into being masked, three female figures try to find a harmony between illusion and disillusion in their longing for the innocence of the ‘untouched’. Incarceration is not a single or discrete event, but a dynamic process that unfolds over time and affects families for generations. Separate Sentence (2016) is a 15-minute dance/theater film that draws upon individual experiences and physical memories of a cast comprised of Bay Area artists– some of whom are fathers or sons who have experienced incarceration. An evening with the experts. Come hear stories and learn tips from the artists in the industry. Whether you are a choreographer wanting to make a dance for film or a film-maker inspired by dance, there are many things to think about when venturing into making a dance for film: the process of storyboarding, the realities of budgeting, the differences of choreographing/dancing for a camera, and post-production timelines; the panel will provide you with their valuable insights and snippets of their work to inspire you. While the learning curve can feel steep, the possibilities of dance for film are infinite. Let us give you a boost! Dylan Wilbur is a filmmaker and animator transplanted from the Midwest. As one half of the company Pixel Fort, he makes commercial motion graphics and animations for corporate clients and national brands, and sometimes just for fun (i.e. internet points). He has produced and directed two dance films, “Living the Room” and an unnamed project currently in post-production. He has also worked with numerous local dancers in creating visuals for their live performances. His work as a cinematographer and editor on the web series, “The Digits” has twice been nominated for an IAWTV award, and he has produced numerous music videos and animations for local bands. He doesn’t find much time to spare, but if he did he’d probably spend it hiking in the gorge, rock climbing, camping, or otherwise getting as far away from a computer as possible. Amy Leona Havin is an Israeli dancer, choreographer, and performance artist based in Portland, Oregon. She first began training with Ohad Naharin’s Gaga Movement Language and holds a Bachelor of Fine Arts in dance performance and choreographic studies from Cornish College of the Arts in Seattle, Washington. Upon graduation she was invited to attend workshops in Kibbutz Ga’aton, Tel Aviv, and New York City before relocating to Portland in 2013. She currently acts as Artistic Director for dance-based company, The Holding Project, and has been an artist in residence at Disjecta Contemporary Art Center as well as producer and director for various dance film projects. Gabriel Shalom is an award-winning director and video artist with a focus on music, dance, design, and fashion. Profiled by French Vogue for his documentary work, recipient of the ADC Young Guns award for his branded content commissions, he is an international public speaker on trends and futurism. He’s directed videos for MINI, Sephora, Sony, Shure, Wieden+Kennedy and BMW. As an artistic consultant for industry-leading foresight companies The Future Laboratory (London), BOX 1824 (São Paulo), and Boston Consulting Group (Berlin) he has worked for clients such as Nokia, Unilever, and the Daimler Group. His video artworks and documentary essays have been commissioned and exhibited in international museums and festivals, including MU Eindhoven, Transmediale Berlin, and the Frankfurter Kunstverein. Located in Portland Oregon since 2015, Gabriel is the director of Vocoder Films, a production company focused on the development of design fiction projects. He is also the founder and director of That Soft Hysteria, a label for site-specific dance fashion films. Jessamine Fok is an emerging director/writer, and is entering her second year at Ryerson University’s film production program. Less than a year ago, she left her job as a marketing professional to pursue a career in the film and television industry. Her portfolio includes work in music video and film, including a TV feature called Jazz Hands and a Canadian Film Centre short titled Mary. Before being immersed in cinema, she studied contemporary dance and also trained at Broadway Dance Centre’s International Student Visa Program in New York. Being a former dancer with an affinity for film and photography, she has always been drawn to combining the two forms of creative expression. As a director, she sees film as a visual medium that can bring the element of storytelling to dance, and create a more intimate view of how movement is experienced by removing the physical separation between audience and stage. White Flag is Jessamine’s first film and role as a director – a long-awaited vision realized combining visual art, dance, and film. White Flag screens during PDFF Picks 1 – August 26th at 7:30 at 5th Avenue Cinema! Return to the World of Dance is an instructional guide for those perplexed by the post-modern condition. Return to the World of Dance is not about dance but is a tribute to Fernand Léger’s Ballet Mécanique. In four episodes a consultant gives expert advice on body language for the office environment. Dancing between waking and dreaming, a day seen through the eyes of eleven young residents of the Friendship Village in Vietnam who are living with disabilities caused by Agent Orange. As the film progresses we are welcomed ever deeper into their richly symbiotic world. A funny, brutal and deeply personal exploration of masculinity and American values, MONUMENT is set in the imposing interiors of an abandoned 1930’s Elk’s Lodge. Scene by scene and room by room, the dancers unpack their relationships to tradition, gender identity and sense of self. With an original score by Chris Garneau, the ensemble takes shape both as embodiments of dance-historical material and as ghosts – quietly navigating a world with fast-changing rules where they must work together to find liberation. Wake is a reflection on the isolation that technology can create and an invitation to reconnect and rebuild relationships with the people and elements around us. Curing Albrecht shows a young man who checks into a bespoke institution, hoping to be cured of his inability to stop dancing. Directed and choreographed by Morgann Runacre-Temple and Jessica Wright, the short dance film is inspired by themes of dancing and madness in the iconic ballet Giselle. 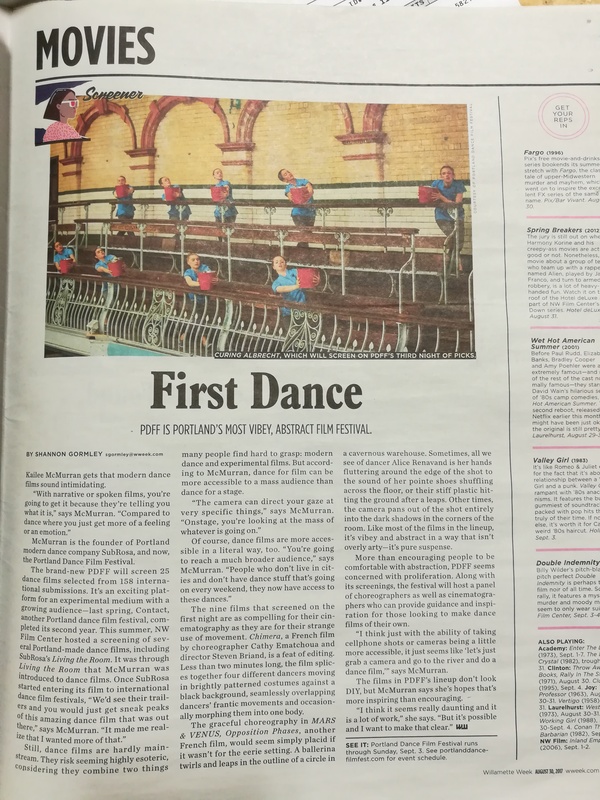 It was filmed on location in Manchester’s spectacular Victoria Baths and features a cast of dancers from Greater Manchester, performing alongside dancer Sam Coren and actor Jenny Runacre. It was commissioned by English National Ballet and produced in partnership with Manchester International Festival. Intrinsic Moral Evil seems to be a tale of identity and coming of age. But above all, the three dancers play with the viewer’s perception and expectations: is it a memory, a dream, a search for identity? Is it about losing friendship or about growing up? The layered story gradually develops; revealing its ultimate secret just before the end credits start. Inviting the audience to make its own interpretation. When a chance supermarket encounter unlocks untapped passion in an ordinary woman, her grey life quickly goes into sensory overload. ‘Your approval is not essential’ sheds a colourful, whimsical light on what happens when you let go of your inhibitions and – out of the blue – start embracing life’s quirky pleasures.